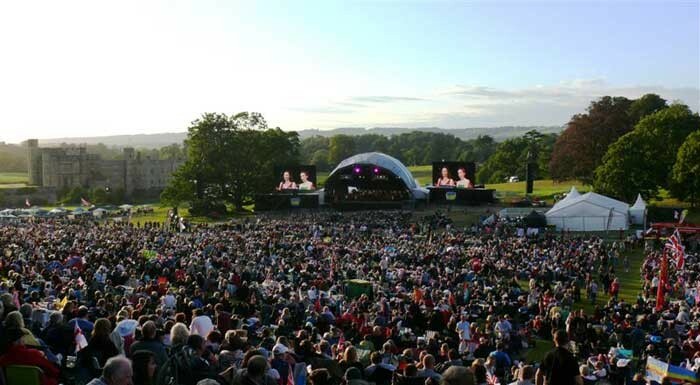 Across the weekend of July 16 and 17, Leeds Castle near Maidstone in Kent (‘The Loveliest Castle In The World’) hosted a major two-day musical event, with large Outline GTO and Butterfly systems deployed by SRD Group for both concerts. On Saturday the Heritage Events Leeds Castle Open Air Classical Concert 2011 featured the Royal Philharmonic Concert Orchestra conducted by John Rigby, playing a wide selection of popular classics. Sunday saw a complete change of pace with ‘Live At The Castle 2011’, featuring Europe’s No.1 boy band The Wanted alongside performances from Alexandra Burke, new girl-band Fanfare, Stacey Solomon, Eliza Doolittle and Aggro Santos amongst others. The main L&R system was Outline’s new flagship GTO line-source enclosure, flown 12-deep each side of the stage. Dual delay towers, each comprising twelve Outline Butterfly elements, were also deployed and combined seamlessly with the main system to provide the necessary coverage of a very large and awkwardly-shaped audience area. A further six ground-stacked Outline Butterfly elements per side provided front of stage fill. All the systems were powered by Outline T11 amplifiers and controlled by Lake LM26 processors via Dante networks. On Saturday the primary orchestra mix of 128 channels was handled by Ian Barfoot with ten digital stems sent to FOH, handled by Chris Beddall mixing on an Allen and Heath iLive digital console. A further iLive handled the complex on-stage monitor mix. Sunday headliners The Wanted were mixed at FOH by Andrew Thornton on a Digidesign Profile, with all other acts mixed used an iLive 112 surface. Barfoot also designed the system using Outline’s proprietary 'Open Array' prediction software, and commented: "The software predicted exactly what we consequently achieved and was flawless in its execution." After the show Chris Beddall said: ‘The GTO system can certainly handle the subtleties of orchestral music as well as rock with its huge dynamic range, and has long throw capabilties without compare. I am truly impressed!" Stuart Roberts of SRD GROUP said: ‘The GTO system is amazing and throws an incredible distance with even coverage and excellent intelligibility - what we experienced at Leeds Castle totally substantiates Outlines’ claims of unparalleled far-field performance."